If Enlightenment for the sake of all beings is the fundamental aim of Buddhism, it follows that it should be the most important thing in a Buddhists life. The traditional way of expressing this is to say that Buddhists go for Refuge to the Buddha. The Buddha is a Refuge not because he will help us escape life and its difficulties, but because Enlightenment is a state of release from attachment to false refuges: those mundane things we look to for happiness and security, but which are incapable of providing them. In seeking to gain Enlightenment Buddhists follow the practices that make up the Buddha’s path, and try to grasp the teachings that express the Buddha’s understanding. These are known as the Dharma, so Buddhists also go for Refuge to the Dharma. If we are to practise the Dharma we need the example of others who have done so before us; the guidance of personal teachers who are further on the path than we are; and the friendship of other practitioners. 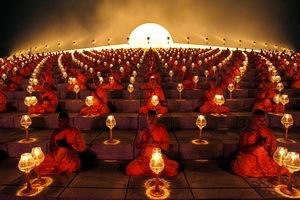 Together these people are known as the Sangha or spiritual community, and Buddhists also go for Refuge to the Sangha. “Going for Refuge” requires understanding. 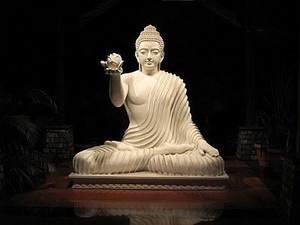 Because one understands clearly the greatness of the Buddha as the original Enlightened Teacher, the Dhamma as the practical Path to Enlightenment, and the Sangha as those who have attained Enlightenment by following that Path, so one has a reasoned and balanced faith which makes possible the required effort that is implied in “Going”. Where is one going? From the confusion and turmoil of greed, aversion and delusion, from the uncertainty of countless beliefs, from obstinacy and conceit, along the straight path with no obscurities to freedom from all defilements, the way out of fear and anxiety, to the development of loving-kindness and insight-wisdom, the latter leading to Enlightenment. So it is Path needing knowledge and wisdom and not one for the blind believer. A “Refuge” is a safe place. It does not mean running away or ignoring what should be known. On the contrary, the Buddhist Refuge in Buddha-Dhamma-Sangha is preeminently the safety to be found in wisdom regarding one’s own mind. How is this? True safety can be sought only in what is morally pure and free from deterioration. The Buddha is such a refuge, as we shall see; so is the Dhamma, and the Sangha. All three are aspects of Enlightenment, so the practising Buddhist can go for Refuge within, to the Buddha-Dhamma-Sangha in his own heart. Other “refuges” that people go to, such as wealth and property, persons other then oneself such as priests, monks, swamis and gurus, or holy places such as churches, synagogues, shrines, temples are all unreliable as they can never be interior refuges and are all subject to change and destruction. They may of course be useful in spiritual development, but they are means, not ends. Even religious refuges where the refuge is other, whether a Creator, Saviour or Messenger, are all unsure, because they cannot be known beyond all doubt.